C&M Transport would like to thank you for your interest in joining our team. C&M Transport is a stable and growing motor carrier of expedited freight throughout the United States and Canada. Founded in 1991, C&M Transport has grown to be an exceptional and respectable carrier of expedited freight. With the expanding interest of expedited freight among shipper and consignee, we at C&M Transport feel we are in the forefront of this growing industry. Please look over the Online Application located on the top menu bar. You need to have the following: proper C.D.L., Current Medical Card with Long Form, Vehicle Registration, and Annual Vehicle Inspection. Once again thank you for your interest in C&M Transport. If you have any questions please do not hesitate to contact us. Cell Phone: You should already have a cell phone when signing on with us. Signs: Signs will be provided by C&M Transport. There is no cost to you for these signs as long as you complete your 90 day probation period. A $150.00 (subject to change) fee will be deducted if you leave C&M before 90 days. Drug Screening: C&M Transport will set an appointment with our facility for your pre-lease drug screen. We will deduct $60.00 (subject to change) from a future settlement. A DOT Physical can also be completed at this time for $35.00 (subject to change) if needed. Safety Equipment: All vehicles need to be equipped with the following: Reflective triangles/flares, fire extinguisher, E-Trac Bars, Straps and Pads. Orientation: Orientation is a one day event starting early morning and ending late afternoon. Have all materials ready and filled out. 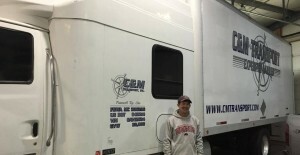 Driver/Dispatch: We at C&M Transport pride ourselves on the high level of customer service we provide. This high level starts with you, the professional driver. As you know we are only as good as our last load with a customer, so we expect our dispatchers and drivers to perform. Each owner operator shall conduct him/herself as a professional and strive to be successful in this industry. We are still gathering information for this section. Please check back soon. We are always looking for new drivers to join our transportation team. If you are interested, contact Mark today to learn more.